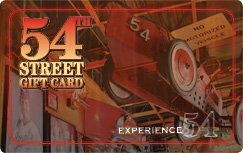 A 54th Street Gift Card is the perfect gift for any occasion! Get or give the delicious taste of 54th Street instantly by ordering an electronic gift card online or by ordering gift cards to be delivered right to your front door. Recipient of eGift or eBonus cards may print OR show on mobile device & provide to server at time of visit. Mailed to purchaser or recipient. For $250 or more in physical Gift cards purchased online, please contact us for information on additional discounts at 1-866-402-5454.